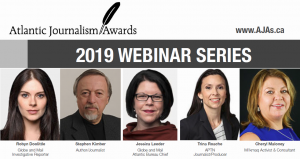 The AJAs invite you to participate in our upcoming series of webinars featuring a host of journalism experts who will share tips, tactics and secrets to make you a better reporter and journalist! On April 23rd, join two-time Michener award winner Robyn Doolittle of the Globe and Mail to learn about her investigative reporting techniques. On May 3rd, join Stephen Kimber, a journalist for 50 years, share his thoughts on what it takes to have a career in local journalism. On May 8th, Jessica Leeder, the Globe and Mail’s Atlantic Bureau Chief will discuss Local Stories: National News. On May 15th, join Trina Roache (Video Journalist / Producer) and Cheryl Maloney (Mi'kmaq Activist & Consultant) to learn how to report on Indigenous issues with understanding and sensitivity.